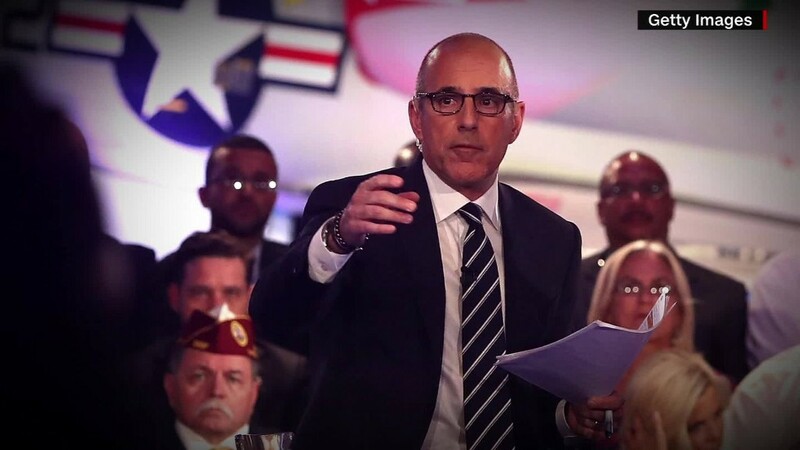 Behind the scenes, NBC execs concede Matt Lauer forum performance was "disaster"
NBC News knows the "Commander-in-Chief Forum" was not Matt Lauer's finest hour. One executive, speaking anonymously, was blunt about it: "Disaster." The day after Lauer's back-to-back interviews of Hillary Clinton and Donald Trump, several high ranking sources at the network said they hear the criticism and agree with at least some of it. Even his internal defenders acknowledge flaws in the forum's production. Lauer was widely criticized for failing to fact-check or follow up when Trump falsely claimed that he was opposed to the Iraq war when it started. Some viewers thought Lauer held Clinton to a higher standard than Trump. The Clinton campaign agreed -- it blasted off a fund-raising email on Thursday afternoon titled "Matt Lauer." But this was not merely partisan warfare. Prominent journalists were sharply critical of NBC. And several people who were sitting in the audience told CNN that they were frustrated too. The ratings for Wednesday night's forum were strong -- almost 15 million people tuned in. But the reviews were pitiful. So what went wrong? That's what journalists both inside and outside NBC are asking now. There is no clear answer. Lack of preparation is one theory. New York Times TV critic James Poniewozik wrote Thursday that Lauer seemed "unprepared on specifics of military and foreign policy: "He performed like a soldier sent on a mission without ammunition, beginning with a disorganized offensive, ending in a humiliating retreat." But Lauer's interviewing skills are second to none. He has hosted thousands of episodes of the "Today" show. And he had a week to prep for the forum. The blame does not fall on Lauer alone. NBC News and MSNBC chairman Andy Lack, a longtime friend of Lauer's, was intimately involved in the forum planning and execution. "This should be a black eye for Lack," one of the sources said. Others within NBC were considered as potential moderators. A source said Chuck Todd, Andrea Mitchell and Rachel Maddow all came up during the process. The time constraints -- less than 30 minutes apiece with Trump and Clinton -- were largely the fault of the candidates themselves, who resisted longer interviews. Iraq and Afghanistan Veterans of America, which organized the event with NBC, wanted more questions to be asked by the vets in the audience -- "and much tougher questions," one of the attendees said. "We expected a serious discussion. We left disappointed," said veteran and author Dave Cullen, who was in the room. Another theory about the forum's flaws involves a heightened sensitivity about Trump. The network's journalists are well aware that its business channel CNBC was pilloried for its performance during a GOP primary debate last fall; the Republican Party said "CNBC should be ashamed" and essentially punished NBC by dropping plans for a later debate on the broadcast network. At the time Trump publicly called one of the CNBC debate moderators, John Harwood, a "disaster" for asking Trump if he was running a "comic book" version of a campaign. Perhaps Harwood's tough questioning looks better in a new light, since Lauer is being criticized for going too easy on Trump. In any case, a top news executive flatly dismissed a suggestion that NBC was trying to stay on Trump's good side -- or Clinton's for that matter. "NBC Nightly News" anchorman Lester Holt is set to moderate the first Trump-Clinton debate of the fall, on September 26, but that event is produced independently of NBC. The network officially declined to comment on the criticism of the event. Some of Lauer's questions to both candidates were carefully crafted. He succeeded in generated news-making responses, especially from Trump, on subjects like U.S.-Russia relations and military sexual assault. But even on NBC's own airwaves, there were implicit criticisms of the forum on Thursday morning. NBC correspondent Peter Alexander said on "Today" that Trump spoke "almost exclusively in generalities." Council on Foreign Relations president Richard Haass, a guest on MSNBC's "Morning Joe," repeatedly said the event was "frustrating." By mid-morning on Thursday, the hashtag "Lauering the Bar," a twist on "lowering the bar," was trending on Twitter.